Last month, I returned home from a sunny, 80-degree Floridian weekend and walked into two feet of the white, fluffy stuff – an abrupt transition I have found myself experiencing quite a few times this winter. 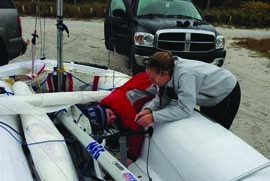 Seeing as most of us don’t enjoy sailing high performance dinghies in frigid conditions – frostbiting aside – my LISOT (Long Island Sound Youth Racing Team) teammates and I have been traveling frequently to locations across Florida for what turned out to be a terrific winter regatta tour. Our adventure started in mid-November as we, and our International 420s, were driven to Miami on three multi-boat trailers after first heading to the I420 Atlantic Coasts at Annapolis Yacht Club. The boats remained in Florida for the next few months, moving from yacht club to boat park, regatta to regatta, with training in between. After arriving in Miami two days after the Annapolis regatta, our boats got a good workout at LISOT’s intense, four-day Thanksgiving clinic at the Coconut Grove Sailing Club (CGCS) – a clinic LISOT has run annually for over five years. The weather gods were in our favor, delivering four straight days of 10-15 knot winds, warm temperatures and sunny skies. It was great to leave the drysuits on shore! Because everyone stays at a hotel across the street during the clinic, which eliminates the need for any driving to the boat park, most sailors come to the clinic without their parents. We spend four days sailing, working out, and cooking meals as a team. This year’s Thanksgiving dinner, after a full day of sailing, was on the back deck of the CGSC. After the clinic we were able to store our boats, fully rigged, in a boat park down the street from the sailing club. Not only was it helpful to not have to de-rig and pack up the boats, but the time saved meant we could train longer on the water before making the mad dash to Miami Airport. We returned home to the oncoming winter, leaving our boats to bask in the South Florida warmth, although we’d be back soon enough. And just few weeks later, we were back. As many youth sailors know, the Christmas holiday week is the time to be in Miami for Orange Bowl – the largest youth regatta in North America. For many LISOT sailors, this also included a few days of training before Christmas day. We were pleased to find that our boats were exactly how we left them – rigged and ready to hit the water. 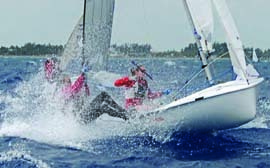 The Orange Bowl has grown to include not only the youth regatta run by Coral Reef Yacht Club with Optis, Club 420s, Lasers and Radials, but also the no-age-limit regatta (for I420s, 29ers and over-18 Laser sailors) run by the CGSC just down the street. With over 700 sailors converging on The Grove, it’s a week of great sailing and fun evenings out on the town. We had 10 days of sailing, starting with training before Christmas and concluding with 10 races over the 4-day regatta in the 19-boat I420 fleet between Christmas and New Years. While most sailors took Christmas Day off, our I420 needed the centerboard gasket replaced – an effort that ended up taking up most of the afternoon. At least it was sunny and warm while my crew Haley Fox (Ft. Lauderdale, FL) and I did boat work. After Orange Bowl we packed up our boats and got ready to drive west across Alligator Alley and up to Clearwater Yacht Club and the Clearwater Community Sailing Center for the most important youth regatta of the year – US Sailing’s Youth Worlds Qualifier, which was to be held two weeks later, over MLK Weekend. But before we went to Clearwater, we took a detour up to Ft. Lauderdale to Haley’s home club for a New Year’s Eve party and to attend an event with 40 years of tradition – Lauderdale Yacht Club’s annual Hangover Bowl. This is a very low-key match race regatta for all sailors of all ages, and a lot of fun. Even better, our I420 stayed firmly on its trailer – the Hangover Bowl is sailed college regatta-style, in shared C420s owned by LYC. Unlike past years, some of us had school vacation for a week after New Year’s, which enabled us to stay in Clearwater (after driving across from Lauderdale) for four days of training in the swells and current of the Gulf of Mexico at the Youth Worlds Qualifier venue before heading back home. Again, we left our boats in the boat park while most of us retreated to the frozen north. Ten days later, our boats were ready, just as we’d left them. The Youth Worlds Qualifier selects the top Boy and Girl I420 teams that will represent the USA at the ISAF (International Sailing Federation)Youth Worlds (this year in Cyprus in July). 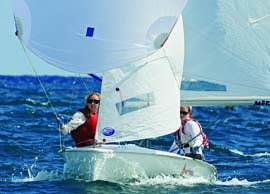 The first and second place boats are also named to US Sailing’s Olympic Development Team. As the sole qualifier this year for the Youth Worlds, the regatta also includes the Olympic and Olympic ‘training’ classes: Lasers, Radials, 29ers, NACRA 17 catamarans and RS:X sailboards. Last year, sailing with Abby Rohman on the wire, we were fortunate to win the Qualifier (in California) and had the honor of representing the USA at the ISAF Youth Worlds in Dublin, Ireland. This year a repeat was not to be. Haley and I (Abby aged out and is a freshman at Dartmouth) took the silver medal and were named to US Sailing’s Development Team, finishing a close second to our LISOT teammates Casey Klingler (Larchmont YC, Larchmont, NY) and Fiona Walsh (American YC, Rye, NY), who sailed a terrific regatta and are going to Cyprus. After pausing briefly for the medal ceremony, we loaded up our boats and headed to Tampa Airport for another trip back home. While we huddled by our fireplaces, our boats were heading across Florida once again, this time to Lauderdale Yacht Club for the newly revised LOCR (Lauderdale Olympic Classes Regatta), two weeks after the Youth Worlds Qualifier. Two weeks later, for what felt like the hundredth time, we flew back down to the warm sun to ready our boats. Sailing at Lauderdale YC is always fun since racing is usually out in the ocean where we get the chance to sail in big swells, and this year was no exception. On the final day we had a 20-knot onshore easterly that brought 5- to 6-foot steep waves rolling in from the Gulf Stream, making for some exciting upwind legs and fast and furious downwind runs with the chute flying and Haley flat out on the trapeze. We launched our trusty Nautivela-built I420 off many giant waves in that last race – often having the boat literally drop down underneath us off the backside of the wave, leaving us hanging in mid-air. It was quite a ride. We were pleased to take five bullets in the 7-race series, including winning the last one, especially since it was at Haley’s home club. Our boats have spent a total of four months criss-crossing Florida to train and compete at numerous locations, while we flew back and forth to New York. By leaving our own boats down for the whole winter season, and with regattas staged within a few weeks and a few hours’ drive of each other, we avoided costly charter fees, the dreaded unfamiliarity of getting used to the quirks of a charter boat, and the hassle of schlepping our gear on a plane every other weekend. Most important of all, we had the ability to keep sailing and training throughout the winter. Soon our boats will be back home, in time for LISOT weekend training to resume in the slowly-warming waters of Long Island Sound. After a few spring LISOT clinics, our boats will get a well-deserved summer break. We’ll be off to away games far from Long Island Sound – Kieler Woche (Kiel Week) in Germany and then I420 Worlds in Valencia, Spain. A member of Team LISOT for 9+ years, 17-year-old Megan Grapengeter-Rudnick is a Senior at King Low Heywood Thomas School in Stamford, CT. She lives in Darien, CT and is a member of Noroton YC (proud home club of 2012 Olympian Rob Crane and 2012 Sailing Hall of Fame inductee Bruce Kirby). Megan has been racing I420s for three years, and Optimists for seven years prior to that. This fall, she’ll be spending a lot of time on Narragansett Bay sailing for Brown University.